In this guide, we will be creating an Ethereum wallet using the popular MyEtherWallet (MEW) service. There’s also other great ways to make an Ethereum wallet such as MyCrypto, but we think MyEtherWallet is the easiest to use for first-time users. The wallet will let us safely store and transact with our ETH as well as ERC-20 tokens. Always make sure you are using the correct website, as MyEtherWallet is commonly imitated by scammers because of its popularity. When you visit for the first time, the website provides a helpful walkthrough of the steps you need to take to ensure you’re safe. Read the walkthrough carefully, as it also clears up many of the common misconceptions regarding what MyEtherWallet is and what it does. Once you’ve read the walkthrough, you will land on the main page of MEW. Now, you have to come up with a password that will be used to encrypt your private keys. 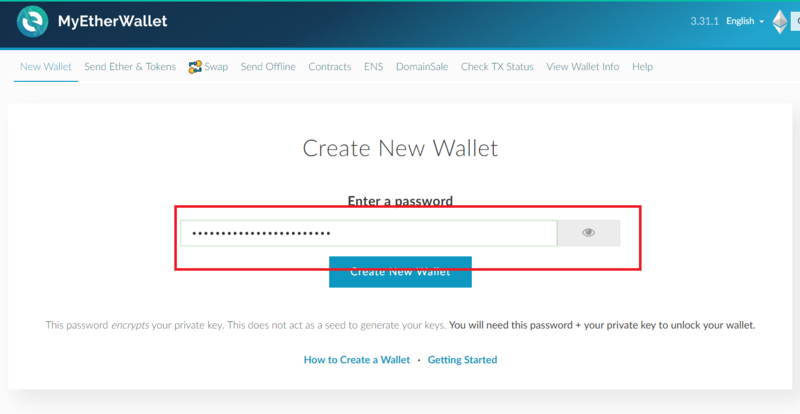 Enter the password and click “Create new Wallet”. Now, MEW will generate a keystore file for you to download. Once downloaded, you shouldn’t be opening this file of your computer, but only use it to unlock your wallet via MEW or other Ethereum wallet clients. Once you’re done, click “I understand. Continue.”. MEW will generate a private key and give you an option of printing a paper wallet. 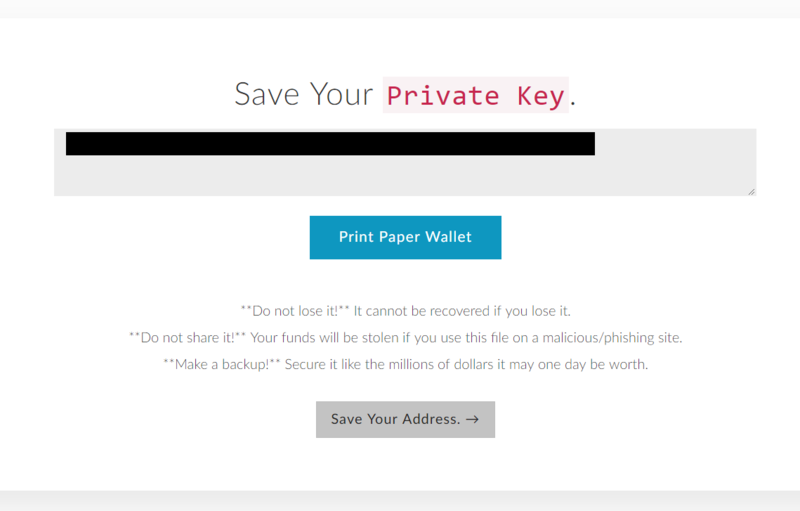 It’s up to you if you want to store your private key digitally, on a paper wallet, or both. Whatever you choose to do, always keep your private key safe and never share your private key with anyone. If you choose to create a paper wallet, do not store the PDF file that is used to print the paper wallet on your computer without encryption. Now, MEW will present us with a range of options for accessing our wallet. In this guide, we’ll be using our private key to access our wallet, because it means we don’t need to download any additional software or purchase any items. This is not the safest way of going about things, and we strongly encourage you to consider purchasing a hardware cryptocurrency wallet such as the Ledger Nano S if you are dealing with an amount of funds that is substantial to you. For just getting started with small amounts and experimenting with Ethereum, DApps, and tokens, the private key method will work fine. If you decide to step up your ETH game and handle larger amounts, we recommend you create a new wallet with MEW and access it through safer methods such as a hardware wallet. After we paste in our private key and press “Unlock”, we will be able to see our new address for the first time.